A three-minute video showing female students being robbed by two men has gone viral after being posted on Facebook. The video showed how two men easily and quickly snatched an electronic gadget from their victim then sped away in a motorcycle. The whole snatching incident happened in just a few seconds. 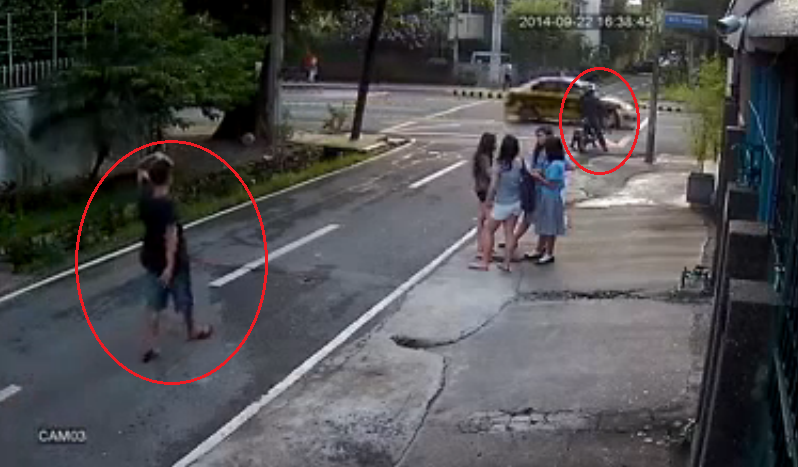 A closed-circuit television (CCTV) camera installed nearby captured the incident. In the beginning of the video, four girls can be seen standing and talking on the sidewalk near a street intersection. Moments later, a man in a motorcycle followed by another man on foot pass the girls. At first glance, the two men seem not to know each other. The man in the motorcycle stopped at the intersection and idled there while the other man walked to the right, disappearing from view. The man on foot returned, approached the other man in the motorcycle and seemed to ask him a question. The man then walked back to where they two originally came from. Several seconds later, the man returned and when he was a few feet away from the girls on the sidewalk, he pounced one of the girls, pinned her on a nearby wall, snatched the gadget she had in her hand, ran to where the other man in the motorcycle was waiting and they immediately sped away. Taken by surprise, the other three girls watched in shock as the snatching transpired. It's unclear where in the Philippines the robbery occurred. Two of the girls seem to be wearing school uniforms so they could either be high school or college students. Shocked by the incident, they weren't able to do anything or shout for help before the two men escaped. Crimes involving motorcycles have been on the rise in the Philippines. Not only are bikes accessible, they are also much easier for criminals to use when trying to escape their victims and evade the authorities. This has prompted some cities in the country to come up with ordinances prohibiting men riding in tandem on motorcycles.